It is probably the most important panel for international cooperation: the United Nations Security Council. Since the beginning of 2019, South Africa is again one of the Council's non-permanent members and represents the interests of the African continent there, together with Ivory Coast and Equatorial Guinea. With a seat on the Security Council, the countries can have an important say in questions of world peace and international security policy. This is one of the declared goals of South Africa, the largest of the three countries. "South Africa will use its tenure in the Security Council to promote the maintenance of international peace and security," said Foreign Minister Lindiwe Sisulu after the election of her country by the UN General Assembly. "Our tenure in the Security Council will be dedicated to the legacy of President Nelson Mandela and his commitment to peace." After 2007/8 and 2011/12, this is the third time that South Africa has a seat. The UN Security Council has 15 members, five of them permanent and ten non-permanent. 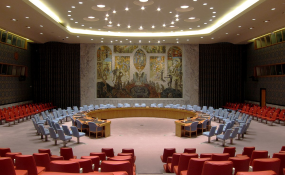 Great Britain, France, Russia, China and the US are permanent members of the body and, as former victorious powers of the Second World War, have special powers of veto: Each of these states can hinder decisions by the Security Council. This is a problem for the African members of the Council: How can they successfully represent the interests of their continent vis-à-vis the veto powers? "We have learned from past debates within the United Nations that it is important for African countries to speak with one voice," said Gustavo de Carvalho, UN expert at the South African Institute for Security Studies (ISS) in Pretoria, in a DW interview. "Unified positions carry a much stronger weight in the outcome of Security Council resolutions." According to De Carvalho, however, this can only happen if a certain degree of coordination and unity is achieved between the three African member states. South Africa must play a proactive role in bringing the states together. "It will not always be easy to consolidate similar positions, but the process of coordination - also including the African Union (AU) - is crucial," said de Carvalho. "If that is not possible, it will be difficult." There are obstacles to overcome: Equatorial Guinea is criticized by human rights organizations, the recent history of Ivory Coast is plagued by civil wars and political division. According to de Carvalho, visible leadership can therefore be expected only from South Africa. He points out that it is historically unusual for a country to be represented on the UN Security Council three times within a short period of time. The candidacy coincided with a period of political upheaval under the new President Cyril Ramaphosa. Thanks to its history, South Africa could make an important contribution. "Peace and security were important aspects of South Africa's history," de Carvalho said. South Africa used its experience gained after apartheid to mediate in conflicts on the African continent. Chris Vandome of the London-based think tank Chatham House also expects South Africa to play a more prominent role than the other two African countries. He says this can be seen from the fact that South Africa took a clear stance in the conflicts following the recent elections in the Democratic Republic of the Congo. "Within the SADC community of states, the government has also been committed to a political solution that is advantageous for Congolese citizens in the long run," he said. However, not too much should be expected from South Africa, Vandome cautioned. "The 'Ramaphoria' is over and the president has internal political problems to solve." The economy must grow, land reform must be implemented. "Even though South Africa has had ambitions for a permanent seat on the UN Security Council for years, I don't see it in view of this situation." The country is proud to be back in the United Nations club after the end of apartheid in 1994. "But South Africa also likes to act unilaterally and not necessarily to integrate," Vandome said. In the past, it also used the UN Security Council to promote its own human rights agenda. "But South Africa's foreign policy has become more pragmatic on its way into the international community."